One of the cool things about knowing the basics of cooking is that you get to the point that you can have a really cool idea and have the know how to actually pull it off. Long story short I had to make this with only a basic concept but I also knew that I was going to need to make it easy enough for you fine folks to make at home and when I started working on this, I really started to see it’s full potential. Leeks have a very subtle flavor and add a nice bit of vibrance that really shine in this dish. Plus it works with other winter and spring menus. Split the leek in half and shred. Take the butter and flour and make a roux in the small pan while stirring the cream. When the roux in a really light golden brown, remove it from the heat and add half of it to the cream. Taste it and then adjust with salt and pepper. 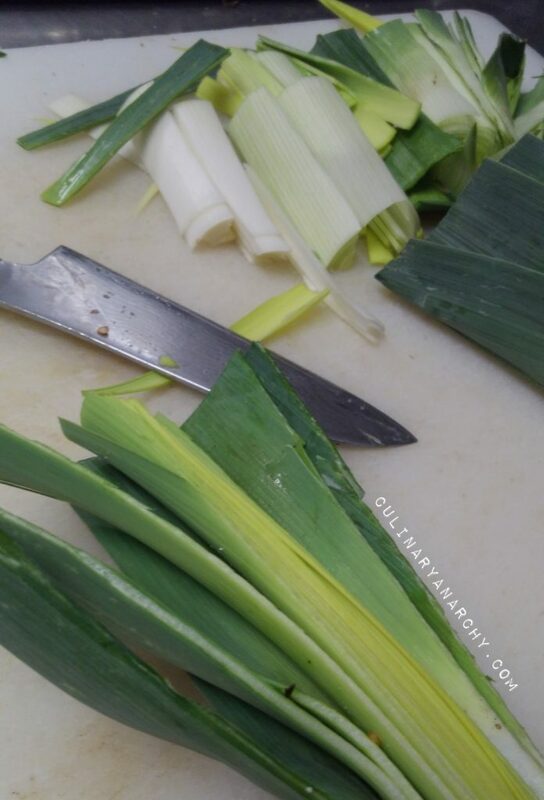 You will need to add these but you should taste the base sauce so that you really get the flavor of the leeks before overpowering them with seasoning. Add more roux if you want a thicker sauce, less for a thinner sauce. You can always run this through a blender for a smooth texture but I like them the way they are. Just remember, it’s your Kitchen, it’s your call. Pasta is easy to pare this with, I’m using it for raviolis but it also goes well with lighter meats like Chicken, Fish or even Pork.